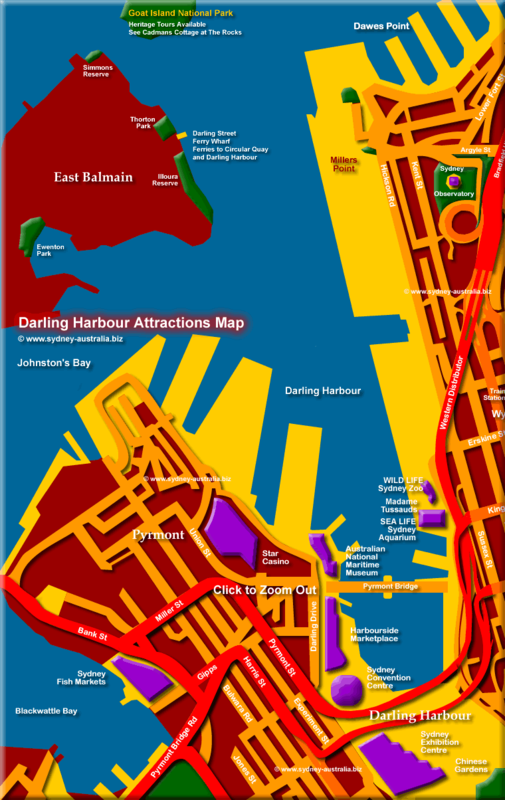 The map shows the locations of Darling Harbour’s SEA LIFE Sydney Aquarium, WILD LIFE Sydney Zoo, Madame Tussauds, Australian National Maritime Museum, Star Casino, Sydney Convention Centre, the Fish Markets and the Sydney Exhibition Centre. At the bottom right are the Chinese Gardens. In the north is the Goat Island National Park which you can also visit to get unique views of Sydney Harbour. Shopping for gifts, fashion, accessories or all things Australiana? Try the Harbourside, where you can get all those things and more. They also have eateries and a number of restaurants and bars. Next Picture: West Sydney CBD - West Sydney CBD. Previous Picture: Sydney City Map - Kings Cross to Central - Sydney City Map - Kings Cross to Central. Darling Harbour was specifically rebuilt as the city’s entertainment, business convention and exhibition centre, with its close proximity (a 15 minutes walk west from Chinatown or the Town Hall) to and from the Central Business District of Sydney. There are a number of world class hands on museums located there, such as the National Maritime Museum complete with boats and ships to clamber on, only a few blocks away (south west) is the Powerhouse Museum. For Darling Harbour Hotels and other Sydney accommodation, see the Sydney Hotels Map. City trains are an easy way to get to and from Sydney Airport. See more about Sydney Airport. Museums in Sydney and NSW: Museums in New South Wales. Finding jobs, employment Australia Work. For Australia Hotels and other accommodation, see Hotels in Australia.